Location of Edwardsville in Madison County, Illinois. Edwardsville is a city in Madison County, Illinois, United States. As of the 2010 census, the population was 24,293. It is the county seat of Madison County. The city was named in honor of Ninian Edwards, then Governor of the Illinois Territory. Southern Illinois University Edwardsville, the Edwardsville Arts Center, the Edwardsville Journal, the Madison County Record, and the Edwardsville Intelligencer are here. Edwardsville High School and Metro-East Lutheran High School serve students in the area. 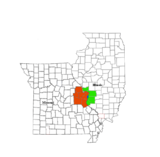 Edwardsville is a part of Southern Illinois, the Metro East region, and Greater St. Louis. It is part of the Edwardsville School District, which also includes the villages of Glen Carbon, Hamel, and Moro, as well as the townships areas around them. A 2010 issue of Family Circle magazine named Edwardsville third of their "Top 10 Best Towns for Families." MCT Trails: Madison County Transit has developed more than 125 miles (201 km) of scenic bikeways that weave throughout the communities of Edwardsville, nearby Glen Carbon and beyond, and connects its MCTTrail system with its public bus system. The trails are mostly asphalt. Maps of the trails, which connect to neighborhoods, schools, business districts, SIUE, parks, and more, are available on kiosks throughout the trail system or online at www.mcttrails.org. Watershed Nature Center: 46-acre (190,000 m2) wildlife preserve. The interpretive center displays native Illinois plants and animals and has education about the environment. Programming for children and adults is available. SIUE Campus: Located on 2,660 acres (11 km2), the SIUE campus is one of the largest college campuses in the United States. The property includes rolling hills, acres of forests, and extensive fields. Edwardsville Parks: Glik Park, City Park, Edwardsville Township Park, Leclaire Park, and Lusk Park. Arts & Culture: Edwardsville Arts Center, Wildey Theater, Edwardsville Children's Museum, Madison County Historical Museum, Mannie Jackson Center for the Humanities. Edwardsville was incorporated in 1818. The first European-American settler was Thomas Kirkpatrick, who came in 1805, laid out a community, and served as the Justice of the Peace. He named the community after his friend Ninian Edwards, then territorial governor of Illinois. 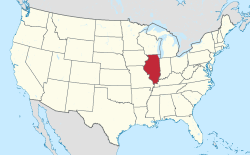 (Illinois did not become a state until 1818.) The Edwards Trace, a key trail in the settlement of Central Illinois, used Edwardsville as a northward launching point. In 1890, St. Louis industrialist N.O. Nelson chose a tract of land just south of Edwardsville to build plumbing factories. He also built a model workers' cooperative village called Leclaire. He offered workers fair wages with reasonable working hours and a share of the profits. He named the village in honor of the French economist Edme-Jean Leclaire. The village also provided educational and recreational opportunities and made it financially possible for anyone to own his own home. Unlike company towns such as Pullman near Chicago, the welfare and quality of life for the workers and their families was a major concern. In 1934, the Village of Leclaire was incorporated into the City of Edwardsville. The area has a lake and park, baseball field, and the Edwardsville Children's Museum in the former Leclaire schoolhouse. Several Nelson factory buildings were renovated and adapted for use as the historic N. O. Nelson Campus of Lewis and Clark Community College. The recognized Historic District has been listed on the National Register of Historic Places. Each year on the third Sunday in October, the Friends of Leclaire host the annual Leclaire Parkfest with food, live heritage music, historic displays & tours, artisans, children's activities, a book sale, and more. In 1983, Edwardsville’s historic Saint Louis Street was also listed on the National Register of Historic Places. Dating back to 1809, this Historic District has a mile-long visual landscape. More than 50 historic homes date from the middle 19th century to early 20th century. The protection and preservation of Saint Louis Street is overseen by the Historic Saint Louis Street Association. Five Illinois governors came from Edwardsville: namesake Ninian Edwards, who became a territorial governor in 1809 and later served as governor from 1826–1830; Edward Coles, elected in 1822 and a strong opponent of slavery; John Reynolds, governor from 1830 to 1834; Thomas Ford, governor from 1842–1846; and Charles Deneen, governor from 1909 to 1913. Former president Abraham Lincoln was in Edwardsville twice, as an attorney in the 1814 courthouse and a speaker outside the 1857 courthouse on Sept. 11, 1858. The present county courthouse, a square, four-story neoclassical structure of white marble that rises to six stories at the back section, was constructed from 1913-15. According to the 2010 census, Edwardsville has an area of 20.165 square miles (52.23 km2), of which 19.56 square miles (50.66 km2) (or 97%) is land and 0.605 square miles (1.57 km2) (or 3%) is water. As of the census of 2005, 24,047 people, 7,975 households, and 5,199 families resided in the city. The population density was 1,549.2 people per square mile (598.2/km2). There were 8,331 housing units at an average density of 600.6 per square mile (231.9/km2). The city's racial makeup was 87.70% White, 8.66% African American, 1.69% Asian, 0.28% Native American, 0.03% Pacific Islander, 0.29% from other races, and 1.35% from two or more races. Hispanic or Latino of any race were 1.00% of the population. There were 10,000 households, out of which 32.8% had children under the age of 18 living with them, 52.4% were married couples living together, 9.9% had a female householder with no husband present, and 34.8% were non-families. 25.9% of all households were made up of individuals, and 8.7% had someone living alone who was 65 years of age or older. The average household size was 2.44, and the average family size was 2.99. The population was spread out with 22.6% under the age of 18, 16.0% from 18 to 24, 29.4% from 25 to 44, 20.3% from 45 to 64, and 11.7% who were 65 years of age or older. The median age was 33 years. For every 100 females, there were 87.5 males. For every 100 females age 18 and over, there were 83.3 males. The city's median household income was $50,921, and the median family income was $65,555. Males had a median income of $47,045 versus $29,280 for females. The city's per capita income was $26,510. About 5.0% of families and 8.6% of the population were below the poverty line, including 7.3% of those under age 18 and 6.0% of those age 65 or over. Ninian Edwards, US senator, judge, governor of the Illinois Territory, and the third governor of Illinois; Edwardsville is named after him. Rudolph G. Wilson, first black school board member/president in the city's history and educational leader for more than 45 years. WSIE-FM 88.7, radio station of Southern Illinois University Edwardsville. WRYT-AM 1080, religious programming (Covenant Network—Roman Catholic). Edwardsville is also served by most St. Louis, Missouri radio stations. ECTV Channel 10, local channel available on Charter Cable in Glen Carbon and Edwardsville. Scenes for the movie The Lucky Ones, starring Tim Robbins and Rachel McAdams, were filmed in downtown Edwardsville in June 2007. However, the scene filmed was set in Denver, Colorado, and banners were hung on Edwardsville's Main Street that read, "Welcome to Denver." Singer Jackson Browne recorded "Cocaine" and "Shaky Town" in Edwardsville's Holiday Inn Room 124 for his album Running on Empty. The Holiday Inn at 3080 S. Route 157 was torn down and rebuilt as a Comfort Suites. A collection of poetry by Nigerian writer Kola Tubosun, Edwardsville by Heart (Wisdom's Bottom Press, November 2018), was based on the time the author spent in Edwardsville for three years as a Fulbright Scholar and student.. The book was described by Howard Rambsy II of Southern Illinois University Edwardsville as “an artistic map disguised as a volume of poetry”, and by Brittle Paper as "a magical meeting place of travelogue, memoir, and poetry." ^ "10 Best Towns for Families: 2010", Family Circle, Retrieved on 2010-08-07. ^ Gannett, Henry (1905). The Origin of Certain Place Names in the United States. Govt. Print. Off. p. 115. ^ "The Edwards Trace". Illinois State Historical Society. Retrieved March 9, 2013. ^ "History" (PDF). Retrieved 10 March 2017. ^ Reinhardt, Cindy (2009). "The cooperative village of Leclaire, 1890-1934". Illinois Heritage. 12 (4): 11–13. ^ Edwardsville web site, additional text. ^ "AJ Schnack". Indiepix. Retrieved 9 May 2010. ^ Niccum, Ann (2008-08-13). "Edwardsville's return to silver screen set". The Edwardsville Intelligencer. Retrieved 2013-05-15. ^ "Discogs entry for Jackson Browne - Running on Empty". Discogs. Retrieved February 12, 2012. ^ "wisdomsbottom". wisdomsbottom. Retrieved 2018-11-18. ^ "Poetry Collection: "Edwardsville by Heart"". ktravula - a travelogue!. 2018-08-11. Retrieved 2018-11-18. ^ Smith, Rosa Inocencio (2018-11-21). "The Books Briefing: Every Literary Family Is Fascinating in Its Own Way". The Atlantic. Retrieved 2018-11-24. ^ "#WeLoveBooks | Edwardsville by Heart by Kọ́lá Túbọ̀sún". Brittle Paper. 2018-10-29. Retrieved 2018-11-18. ^ Arnett, Carol (January 10, 2018). ""House Hunters" comes to Edwardsville". The Edwardsville Intelligencer. Retrieved January 5, 2019.